An infestation of dots, thousands of them, represent oil wells in the Permian basin of West Texas and a slice of New Mexico. In less than a decade, U.S. companies have drilled 114,000. Many of them would turn a profit even with crude prices as low as $30 a barrel. OPEC’s bad dream only deepens next year, when Permian producers expect to iron out distribution snags that will add three pipelines and as much as 2 million barrels of oil a day. 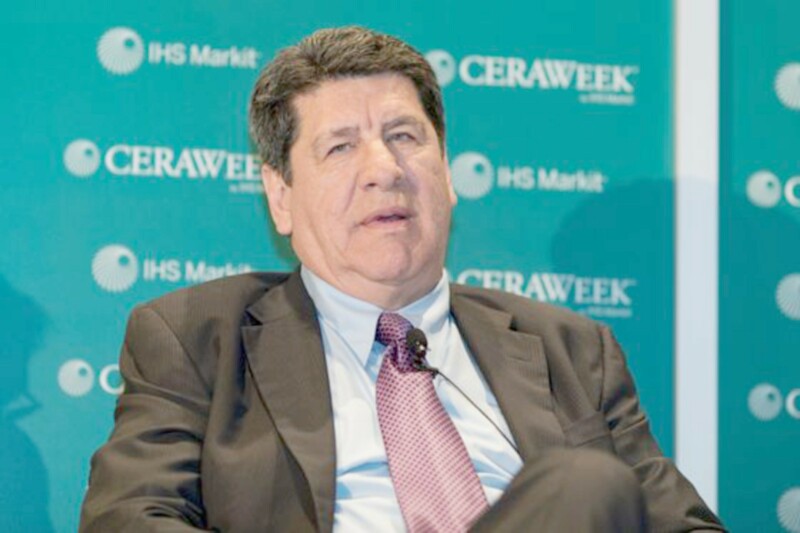 “The Permian will continue to grow and OPEC needs to learn to live with it,” said Mike Loya, the top executive in the Americas for Vitol Group, the world’s largest independent oil-trading house. The U.S. energy surge presents OPEC with one of the biggest challenges of its 60-year history. If Saudi Arabia and its allies cut production when they gather Dec. 6 in Vienna, higher prices would allow shale to steal market share. But because the Saudis need higher crude prices to make money than U.S. producers, OPEC can’t afford to let prices fall. Even so, Saudi Arabia’s output swelled to a record this month, according to industry executives. That means the three biggest producers — the U.S., Russia and Saudi Arabia — are pumping at or near record levels. A similar scenario unfurled in 2016, when Saudi output rocketed just before OPEC agreed to cuts. This time the cartel’s 15 members, and allies including Russia, Mexico and Kazakhstan, will discuss the possibility of their second retreat from booming American production in three years. OPEC helped create the monster that haunts its sleep. After it flooded the market in 2014, oil prices crashed, forcing surviving U.S. shale producers to get leaner so they could thrive even with lower oil prices. As prices recovered, so did drilling. Now growth is speeding up. In Houston, the U.S. oil capital, shale executives are trying out different superlatives to describe what’s coming. “Tsunami,” they call it. A “flooding of Biblical proportions” and “onslaught of supply” are phrases that get tossed around. Take the hyperbolic industry talk with a pinch of salt, but certainly the American oil industry, particularly in the Permian, has raised a buzz loud enough to keep OPEC awake. “You’ve got an awful lot of production that can come in very economically,” said Patricia Yarrington, Chevron Corp.’s chief financial officer. “If you think back four or five years ago, when we didn’t really understand what shale could do, the marginal barrel was priced much higher than what we think the marginal barrel is priced today.” That shift makes shale resilient to a price tumble. After touching a four-year high in October, West Texas Intermediate, the U.S. benchmark, has fallen by more than 20 percent. Only a few months ago, the consensus was that the Permian and U.S. oil production more widely was going to hit a plateau this past summer. It would flat-line through the rest of this year and 2019 due to pipeline constraints, only to start growing again — perhaps — in early 2020. If that had happened, Saudi Arabia would’ve had an easier job, most likely avoiding output cuts next year because production losses in Venezuela and sanctions on Iran would have done the trick. Instead, August saw the largest annual increase in U.S. oil production in 98 years, according to government data. The American energy industry added, in crude and other oil liquids, nearly 3 million barrels, roughly the equivalent of what Kuwait pumps, than it did in the same month last year. Total output of 15.9 million barrels a day was more than Russia or Saudi Arabia. The growth was possible because oil traders decided not to be stymied by the dearth of pipelines. They used rail cars and even trucks to ship barrels out of the region. But pipeline companies unexpectedly increased capacity, in part because they added chemicals known as “drag reduction agents” to increase flow. A new pipeline came online earlier than anticipated, and with three more expected between August and December next year, production is poised to soar. The only obstacle for another surge is export capacity, as most of the incremental output will need to ship overseas. With terminals nearly full, Permian barrels could end piling up in the ports of Corpus Christi and Houston. Even so, few in Houston, or in Midland, Texas, the hub of the Permian region, believe that growth will be anything but gangbusters next year because of the clearing of transportation bottlenecks. U.S. net imports of crude oil and refined petroleum products By the end of 2019, total U.S. oil production — including so-called natural gas liquids used in the petrochemical industry — is expected to rise to 17.4 million barrels a day, according to the U.S. Energy Information Administration. At that level, American net imports of petroleum will fall in December 2019 to 320,000 barrels a day, the lowest since 1949, when Harry Truman was in the White House. In the oil-trading community, the expectation is that, perhaps for just a single week, the U.S. will become a net oil exporter, something that hasn’t happened for nearly 75 years. Saudi officials concede that the tsunami is coming. OPEC estimates that to balance the market and avoid an increase in oil inventories, it needs to pump about 31.5 million barrels a day next year, or about 1.4 million barrels a day less than what it did in October. Global oil demand has so far absorbed the extra U.S. crude barrels, limiting the impact on prices. The loss of output from Venezuela and to a lesser extent, Iran, even allowed Saudi Arabia, Russia and a few others to boost production. But for the cartel, U.S. shale remains as intractable as in the past. Nearly two years later, Al-Falih has lost enough proverbial sleep. He’s about to make a U-turn. He’ll battle what increasingly looks like a structural problem: booming U.S. production. With assistance by Kevin Crowley, Catherine Ngai, and Dave Merrill.